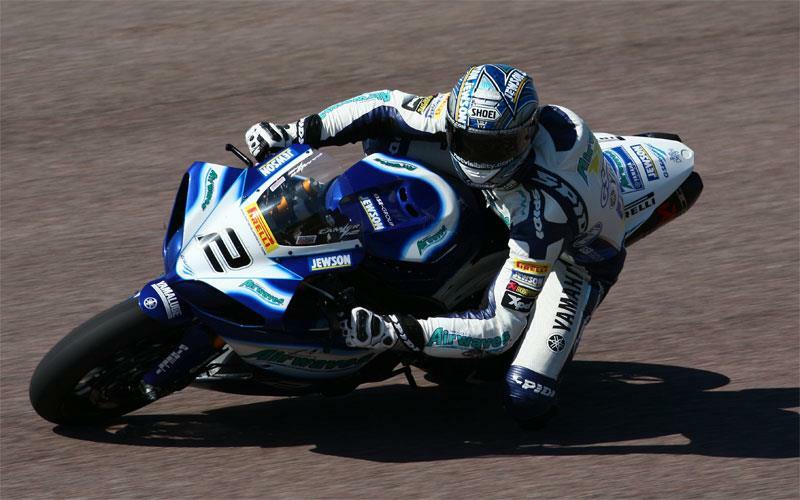 Leon Camier finished his title-winning 2009 MCE British Superbike season in style at Oulton Park with his 19th win of the season on the Airwaves Yamaha. Camier led from the first lap to the finish, winning by 3.7s from Hydrex Honda’s Tommy Hill. For Hill it was his best result of the year, his second podium of the triple-header race weekend. Hydrex Honda team-mate Stuart Easton crashed when he decked his engine casing on the kerb at Britten’s. It was his first non-finish of the 26-race season. Josh Brookes claimed third place on the HM Plant Honda – his best result of the weekend after his kill switch shorted out in the first race on Saturday and he was only seventh in Sunday’s first race. He finished fourth in the championship behind Easton. Ian Lowry rode a brilliant race to claim fourth in the race and fifth in the championship – in his rooke BSB year on the Relentless by TAS Suzuki. After a sluggish start he had to pass Chris Walker, John Laverty and Sylvain Guintoli in the second half of the race to equal his best result of the year. The race was stopped after one lap when Simon Andrews suffered a massive crash at Cascades. Intial reports were that the MSS Kawasaki suffered concussion and was going to hospital for a precautionary check-up but was not thought to be seriously injured. Alastair Seeley was caught up in the crash but was unhurt.